This is the Shimano FC-R8000 Hollowtech II 11-speed Crankset. Re-designed for versatility, Shimano created a unique 4 arm crank spider and paired it with their hollow chain rings for incredible stiffness and weight reduction. This 4 arm spider uses a 110 BCD (Bolt Circle Diameter) that accommodates all modern double chainring pairs. 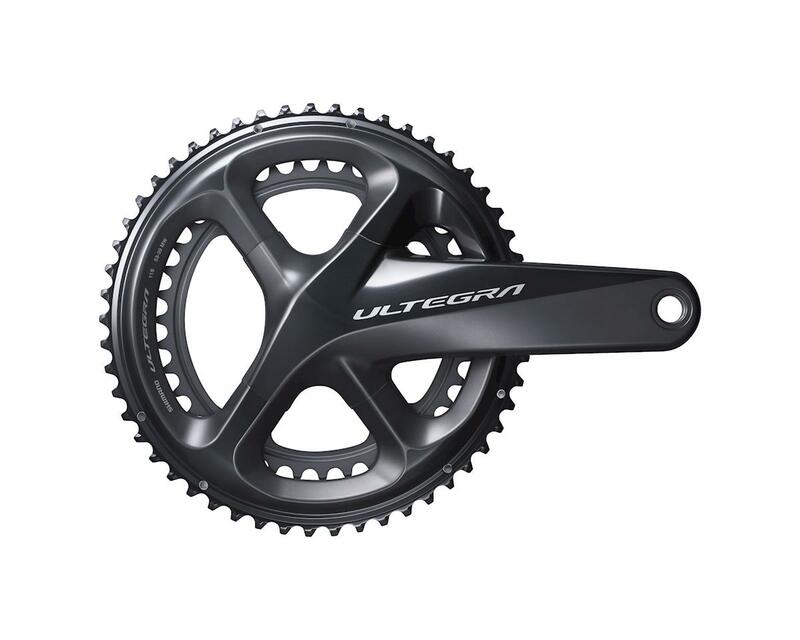 Shimano's Ultegra series is "pro-proven" as it is a direct trickle down from the Dura Ace group. Because Ultegra benefits from previous years of Dura Ace, it benefits with higher durability thanks to the lack of excessive weight reductions. It still stands for state-of-the-art technology, proven in pro races and the technology has time tested durability. Shimano Hollowtech technology--Providing the best balance of stiffness, strength, weight, and rotating performance.